With the new Crazy Chameleon Geocoin, we have made a coin that changes colors depending on its temperature, kind of like a real chameleon! 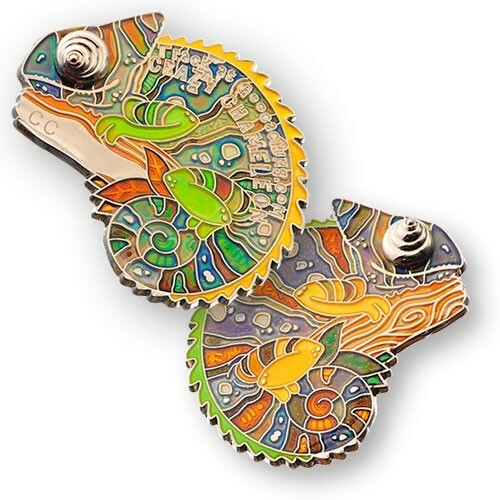 The Crazy Chameleon Geocoin also has spinning eyes that are constantly pointing in different directions. If you love chameleons, this coin is definitely for you! Put one of these coins in a cache for a colorful trackable, or add it to your collection. Chameleons boast multiple abilities, including the ability to rotate their eyes to look in two different directions at the same time. They also possess a long tongue that shoots out of their mouth, snatching prey quickly with the sticky tip. But the most notable ability that the chameleon has is its ability to change the color of its skin. It has often been said that chameleons change their colors primarily to blend in with their backgrounds to hide from predators and camouflage into their surroundings. However, researchers have found that chameleons change their color mostly depending on their mood, along with the temperature and their surroundings. Chameleons have a special layer of cells within their skin that is made up of iridophore cells - iridescent cells that have pigment and reflect light. The iridophore cells contain nanocrystals of multiple shapes and sizes. Chameleons change their skin color by changing the structural arrangement of the upper layer of cells by exciting or relaxing their skin. When the skin is relaxed, the nanocrystals come close together, reflecting short wavelengths, such as blue. When the skin is excited, the nanocrystals separate, reflecting longer wavelengths such as red and yellow. This is how chameleons change the color of their skin. Primarily, male chameleons do this morseso than females and young chameleons because females and their young do not have a large enough layer of iridophore cells in their skin.